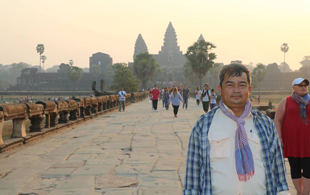 Angkor Temple Guide has been founded by Mr Tes Chhaya, in order to work together as a team of senior professional experienced tour guides who have been guiding visitors since the tourism started in Cambodia after the first general election in 1993. We always share and exchange skills information and benefits from each other in order to improve and develop the career and help the rural areas to reduce the poverty by providing school materials, pumping-wells, bicycles etc. 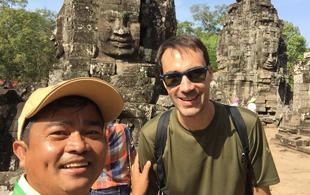 We are all locals of Angkor and are very familiar to the Angkor region.and well-educated, hard working, punctual, informative, friendly, and lot of fun that make your trip unforgettable and memorable in the lifetime. Angkor Guide team and their uniforms. We are all native Khmer, We have been living and working here for a long time, we warmly welcome you all anytime anywhere . We strive to perform our duty to make your trip of Angkor perfect enjoyable and unforgettable. We look forward to see you in Cambodia. Angkor Wat was built by the Khmer king named Suryavarman II in the early 12th century. It is a Hindu temple in favor of Lord Vishnu, it is also a funeral temple of the royalty.Today Angkor Wat is one of the seven wonders of the world among Pyramid in Egypt,the Great Wall of China, Tajmahal in India, Colosseum in Greece, and so on. Angkor Wat is just one among a thousand temples in Cambodia, It is the best preserved monument and always represents the symbol of the national flag of the Kingdom of Cambodia. This is a gold crown that has just found recently in Ta Prohm temple during excavation for the reconstruction of the 'Dance Hall'. it is worth the Khmer treasure from the Angkor period. We used to hear by people us about the property made out of value metal such as gold silver copper bronze gems rubies etc., now it really comes true. This crown was found in March 2012. This is a Naga that has just been dug out from the ground in Beng Mealea temple. It is very well preserved. Beng Mealea is a Hindu temple which was built in the 12th century by the king Suryavarman I. This temple is located in the remote area covered by the jungle, near the Mount Kulen (the stone quarry) that is about 60km from Siem Reap town. Temple Beng Melea is located in the northeast of Angkor near the Kulen mountain, and it has not been cleared from the jungle jet.The temple surrounded by the moat of 1000 meters by 700 meters. Tips: It is really amazing to go into the temple from the west gate that has just been cleared a little bit and it makes you feel really like adventuring in the forest. You have to wear good shoes to climb some piles of fallen stones and use spray to prevent mosquitoes bite. Phnom Kulen Waterfalls is very impressive, it is known as a sacred place for Cambodian people since the time of Angkor. Today the Kulen resort is very popular for people picnicking and enjoy visiting the beautiful nature.